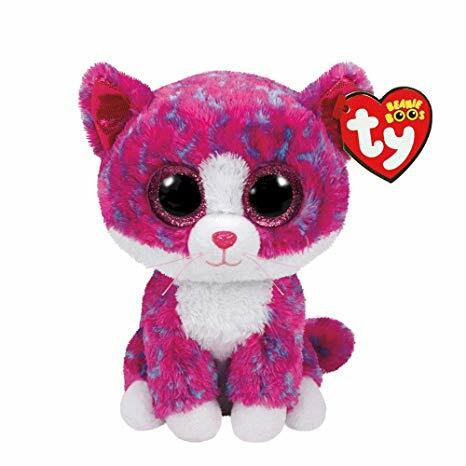 Charlotte is a purple and blue cat with large, glittery pink button eyes and a small bright pink button nose. She has a white belly and white paws. The inside of her ears are shiny pink and she has pink thread whiskers. So I can jump and go ding-ding! Charlotte was released in September 2016. Her Birthday is on 10th April. Charlotte is a Claire’s exclusive Beanie Boo. There are four versions of Charlotte. This small 6″ Beanie Boo, a medium 9″ Beanie Boo Buddy, an extra large 12″ version and a key clip.